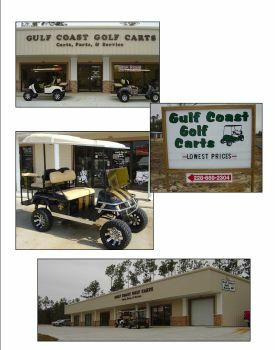 Gulf Coast Golf Carts is one of the largest golf carts, parts, and accessories sellers in the south. 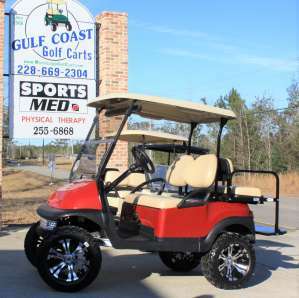 Located in Pass Christian, MS, Gulf Coast Golf Carts is only 20 minutes from Slidell. With guaranteed lowest prices, we'll definitely make it worth the drive. If you are looking to buy a golf cart or fix up what you currently have...give us a call today 228-669-2304. Hey Everyone! rnThis is David at Gulf Coast Golf Carts.rnI thought it might be good to start a post about hunting season coming and the benefits of having a electric golf cart over gas UTV or 4-wheelers.rnrnThings to know...rnA lot of HUNTING CAMPS are making people switch to only electric.rnrnrnRange is still good on most models. My 48 volt ones go on average 20 plus miles on a charge.rnrnAlso with the electric they are VERY quietrnrnLet me know what you think!!!! 2015 Club Car Precedent w/ New Batteries\r\n\r\nNew OEM body (your choice of color)\r\n\r\n6\' MJFX lift kit\r\n\r\nHeavy Duty Rear Leaf Springs\r\n\r\nYour choice of custom tires and wheels 10\', 12\' or 14\'\r\n\r\nNew tinted windshield\r\n\r\nDigital battery meter\r\n\r\nTan seats\r\n\r\nTan top\r\n\r\nAll LED light kit with street kit\r\n\r\nHeavy duty rear flip seat kit\r\n\r\n5 panel mirror\r\n\r\nCart comes with 1 year warranty, batteries come with 18 month warranty.\r\n\r\nCall/ text us at 228-669-2304! !